The film has been out for more than a year now, but Lauren and I just caught it on DVD. 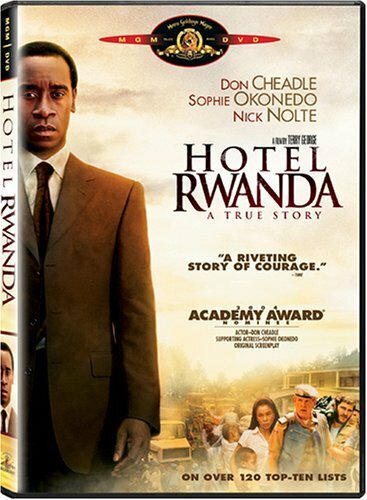 It tells the true (or mostly true) story of Paul Rusesabagina, a hotel manager in the Rwandan capital of Kigali, who, eleven years ago, during the genocidal atrocities of that country, turned his hotel into a refugee camp for more than a thousand people, in effect saving their lives from the murderous Hutus who were killing every Tutsi tribal member they found. More than a million men, women, and children were brutally murdered in a mere three months time. Sadly, the rest of the world turned a mostly blind eye. The film is a hard one to watch, and despite its political potency and eye-opening account of a horror that went mostly unnoticed elsewhere, I can’t recommend it. It’s just too disturbing. The PG-13 rating is questionable. I’d push this more into the R territory, not because the violence is gratuitous — it isn’t, it’s real — but because the subject matter is too painful for any teenager to witness. That sounds like a damning statement, but there’s some truth to it. Had these atrocities occurred in Europe, US troops would be called to aid immediately. But Black Africa . . . well that’s different. The reasoning for this negligence is NOT, I don’t think, as the film suggests, because Black Africans are black. It’s because we, the rest of the wrold, are ignorant of their circumstance. Their society is totally foreign to us. The word “tribe” conjures up a certain primitive barbarism that we, the average, Westerner simply don’t understand. In short, we’re ignorant, stupid in fact. We see the problem as something distant and unintelligible and, because we feel powerless to the evils causing it, we do nothing. After the film was over, I felt deep sadness and shame, meaning that Hotel Rwanda achieved precisely what it set out to do: move its audience from ignorance to social awareness. But I also felt grateful. Suddenly my own problems seemed minute and insignificant. Will I watch it again? No. Am I glad I saw it once? Yes. Definitely. Should you watch it? Well . . . that’s up to you. But be warned. It won’t be a pleasant experience.